The Golden Globes introduced a new award for television special achievement, the Carol Burnett Award, the first honorary should come as no surprise…Carol Burnett. At the 2019 Golden Globes, Burnett took the stage after an opening tribute from Steve Carell that ended with a room-wide standing ovation for the TV legend. Carell said it was the greatest honor of his life to present the award. "I'm really gobsmacked by this," Burnett said on stage. "Does this mean I get to accept this every year?" While accepting the award, Burnett recounted her love of movies and when she first got a TV. "I had a new love. But regardless of the medium, what fascinated me was the way the stars on the screen could make people laugh or cry or sometimes both. And I wished, and I hoped that maybe, just maybe some day, I could have the chance to do the same thing. Well, those childhood dreams came true," she said. Burnett said she sometimes catches herself "daydreaming about being young again and doing it all over, and then I bring myself up short when I realize how incredibly fortunate I was to be there at the right time." Burnett said that's because the show couldn't be done today. The cost alone would prohibit it. Variety shows are virtually nonexistent in today's TV landscape. "And it's sad to say today's audiences might never know what they are missing," she said. "So, here's to reruns and YouTube." But, she said what's the same in today's TV landscape is those "lucky enough to be on television is the belief that we've been given the opportunity to do something we have been granted a gift, a canvas to paint with our talent. One that can make people laugh or cry or maybe do both," she said. "So this award, oh my gosh, so generously named after me, is dedicated to tall those who made my dreams come true, and to all those out there who share the love I have for television and who yearn to be part of this unique medium that has been so good to me. I'm just happy that our show happened when it did. And that I can look back and say once more I am so glad we had this time together. The award is the counterpart to the film honors, Cecil B. DeMille Award. Burnett, 85, is a comedy trailblazer known worldwide for The Carol Burnett Show. The sketch series, which ran for 11 years, averaged 30 million viewers per week and won 25 Emmy Awards. It's one of the most honored shows in TV history. In addition to her namesake award, Burnett has won Emmys, People's Choice Awards, the Horatio Alger Award, an Ace Award, the Peabody and a Grammy. She's also a Kennedy Center Honoree, the recipient of the Kennedy Center Mark Twain Prize for Humor and the Presidential Medal of Freedom. In addition to being a member of the Television Hall of Fame, Burnett has a star on the Hollywood Walk of Fame, the City of Los Angeles named an intersection directly adjacent to Hollywood High School, Burnett's alma mater, Carol Burnett Square and CBS Studios dedicated "The Carol Burnett Artist Entrance" in her honor. Burnett was also previously celebrated with the Life Achievement Award at the 2016 SAG Awards. "For more than 50 years, comedy trailblazer Carol Burnett has been breaking barriers while making us laugh," Meher Tatnam, president of The Hollywood Foreign Press Association, said in a statement before the show. 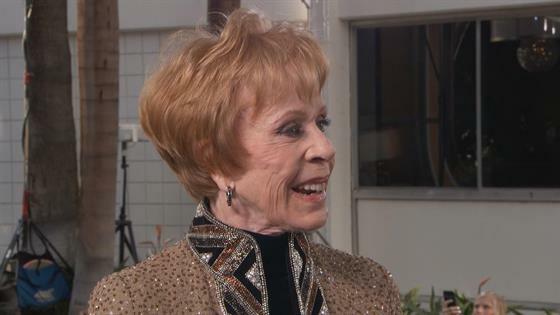 "She was the first woman to host a variety sketch show, The Carol Burnett Show. She was also the first woman to win both the Mark Twain Prize for American Humor and Kennedy Center Honors. And now we add another first to her running list: the first recipient—and namesake—of the new Golden Globe top honor for achievement in television, the Carol Burnett Award. We are profoundly grateful for her contributions to the entertainment industry and honored to celebrate her legacy forever at the Golden Globes."